"Fireside Chat" · The World Table Hockey Association, Inc. 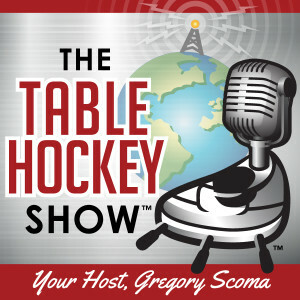 The Table Hockey Show Trademark and Copyright: The Table Hockey Show. All Rights Reserved. The Table Hockey Show, 2nd show. This Week’s Show was Originally Recorded 24 JANUARY 2014, Winter. It was edited and published JULY 3, 2014. HOST AND CO-HOSTS: Gregory Scoma, Washington, DC; Ronald Marsik, Chicago, Illinois; Ajit Sarma, Anaheim, California. * Why the 40 Year Strong Johnny Good Guy Tournament No Longer Allows Winners to Take Trophies Home? Ajit Sarma, Ronald Marsik, Gregory Scoma, Kevin Reardon, Jeffrey Scoma, Mike Wheeler, Grant Ainsley, Mike Pope, Jim Rzonca, Rick Sorci, Dr. Lou Marinoff, Kenny Dubois, Art Krantz, Graham Barber, Inventor Bill Kobayashi, Mark Oblick, John Power, Roger Owens, Bob Cuozzo, Len Mecca, Peter Moulton, the wives and women of the Johnny Good Guy Tournament, Jeremy Davis, John and Ursula Fayolle, and Dr. Kevin Rafferty. * Burlington, Ontario, Canada; Mike Pope, Organizer, 1976. * 2nd Burlington, Ontario, Canada, Mike Pope, Organizer, 1977/8. * Johnny Good Guy, Brampton, Ontario, Canada; Peter Moulton, Organizer, 2005. * Lemont, Illinois, USA; Jim Rzonca, Organizer, 2006/7. * Breezy Point, New York City, USA; John Power, Organizer, 2006. 1. The “Breezy Point Tournament,” Long Island, New York was in September, not “November” of 2006. 2. Two weeks later, Gregory Scoma, Washington, DC, first met Ajit Sarma, Anaheim (adj. Los Angeles) in late September of 2006 in Montreal, Canada at the Hockey sur Table Quebec (HSTQ) tournament. 3. The New York City Table Hockey Association (NYCTHA) opened the 1st week of October 2006. Next Story → Reggie Stefaniszyn – Viking, AL; Europe & NHL’s Sutter Bros.